Let’s restore your clear vision. There are many different problems that can affect your eyesight. But did you know that about 80% of problems causing visual impairment can be corrected? The most common causes of vision problems are called refractive errors. These happen when the shape of your eye prevents you from focusing clearly. The good news is that these common problems can typically be corrected with products and treatments. Get started today by finding a Vision Source Northeast Ohio eye doctor near you and learn more below. Astigmatism is an uneven or irregular curvature of the cornea or lens which can blur or distort vision. Other symptoms include eyestrain, headaches and eye fatigue. Most people have some degree of astigmatism. Moderate to severe astigmatism that impacts the quality of your vision can be treated by your Vision Source doctor. Farsightedness, medically known as hyperopia, refers to vision that is good at a distance but not close up. Farsightedness is caused by the size and shape of your eyeball and how it focuses the image on your retina. 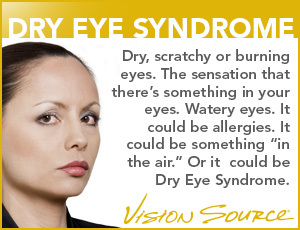 Symptoms include difficulty maintaining a clear focus on near objects, eye fatigue, and headaches. Myopia, commonly referred to as nearsightedness, allows clear vision in close range but not at a distance. The shape and size of your eyeball focuses in a way that distorts distant objects. While this condition generally occurs in children, nearsightedness can develop in adults due to visual stress or health conditions such as diabetes.